» U.S. Colleges Have $500 Billion to Invest. Now Where Are All the Green Deals? If you guessed that the University of California system would champion “sustainable” investing, you’d be correct. The catch is, the shelves in the sustainable investing aisle aren’t especially well-stocked with opportunities. U.S. college endowments altogether hold more than $500 ­billion in assets, a growing part of which they’ve allocated to sustainable or “impact” investing. Yet they also face something of a paradox: Where, exactly, does one invest that money? The easy answer, and one popular among smaller endowments, is to buy funds of stocks deemed green. 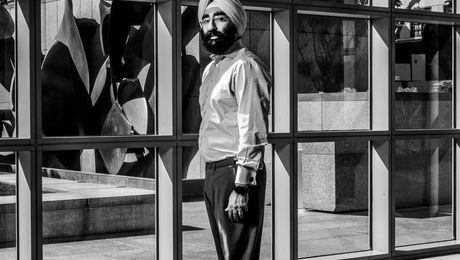 Another option is real assets, says Jagdeep Bachher, who oversees the University of California’s $100 billion portfolio, which includes retirement funds for one of the country’s largest public university systems in addition to the school’s $10 billion endowment, the 12th largest in the U.S. “Institutions are lazy at some level,” he says. “We wait for pitch books to show up.” But that isn’t satisfactory for the Regents of the University of California. The reason: Staving off the worst effects of global warming will require much more investment than is being deployed—trillions of dollars more in coming years, according to estimates from the International Energy Agency. That’s why the system has become prominent in a group of institutional investors deploying money to green projects. The group has committed to putting more than $1 billion into clean energy- and water-related projects that the Obama White House promoted two years ago. 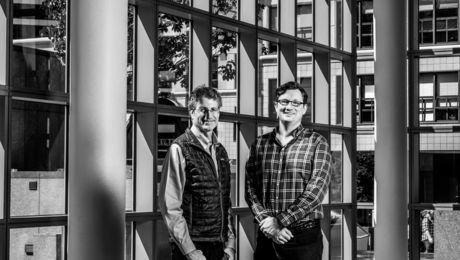 In addition, the investors helped create an advisory group called Aligned Intermediary Inc., which functions like a co-op for them, sourcing investments. The deals Aligned Intermediary identifies are big: They range from $50 million to $500 million, according to co-founder and Chief Executive Officer Peter Davidson. Its members, which also include the Ontario Public Service Employees Union Trust and the New Zealand Superannuation Fund, seek real returns from direct investments in infrastructure—renewable energy, water, even garbage—as well as from loans to projects that help reduce greenhouse gas emissions. “The economic returns are there,” Davidson says. “The responsible investing idea is there. It’s a market imperfection that we need to solve.” The University of California has committed $500 million to these types of projects. While the group’s first transaction, an investment of about $50 million involving water infrastructure in the Western U.S., is on the books, details haven’t been disclosed. For endowments, these types of direct investments have advantages. They skirt private equity and hedge funds’ controversial 2-and-20 fees, and the projects’ timetables run into the decades, substantially longer than a typical fund life of up to 10 years. 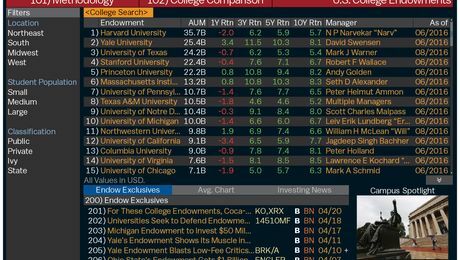 Endowments such as Yale’s helped start the trend toward illiquid, alternative investments three decades ago, with a move into private equity and hedge funds. Yale and Harvard—the wealthiest college funds, with more than $60 billion collectively—were also pioneers in buying real assets, particularly timberland. Yale has even invested directly in a 22-turbine wind farm in Maine. The school’s endowment in a 2009 report extolled four green investments that have partly turned out to be duds. One solar company, for example, went bankrupt. Meanwhile, green funds that bet on clean energy and technology, launched in the past decade, have underperformed. While there’s demand for investments that help address global climate challenges, opportunities aren’t especially easy to find—and most endowments, especially private schools, operate in opacity, so it’s difficult to identify case studies. Williams—the richest U.S. liberal arts college, with a $2.3 billion endowment—provides an interesting glimpse into the difficulties. 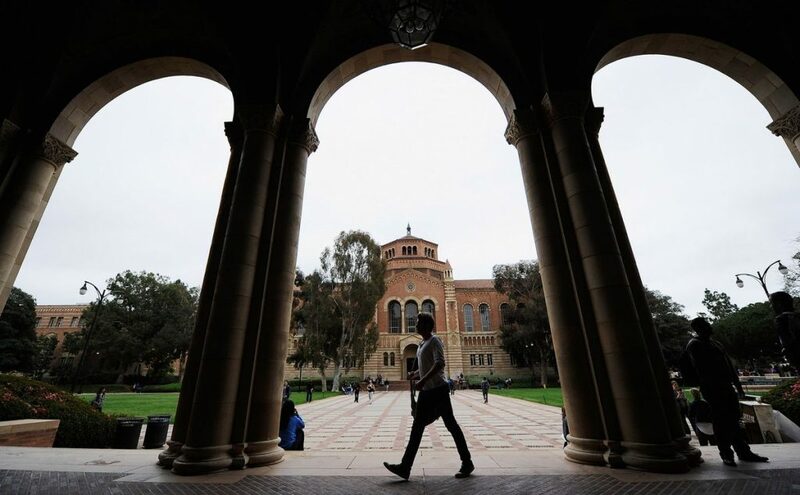 It’s also been laborious for the University of California to find the right deal—even with the staff of Aligned Intermediary on the case. Aligned was structured as a benefit corporation, and its operational funding was provided by philanthropic groups, led by the Planet Heritage, William and Flora Hewlett, and John D. and Catherine T. MacArthur foundations. The organization provides expertise to find deals, perform due diligence, and, if necessary, help oversee the managers running projects. The University of California sifted through 90 proposals before finding the water deal that closed late last year. “You need flexibility and you need patience—and we have these things,” Bachher says. The university will act only when it sees an opportunity that meets all of its requirements, he says. In addition to the deal the University of California inked, others are in the pipeline, Davidson says. They include an investment in a solar power developer in North America, expected to close in June, and a mezzanine loan to a large-scale private wind, solar, and biomass company that operates globally.